Hundreds of neighbors, kids and parents attended National Night Out held for the Duboce Triangle and the Park Station Police District at the Harvey Milk Photo Center Exhibition Room and the upper lawn area on Tuesday, August 2, 5-8 p.m.
Park Station and their Community Police Advisory Board (CPAB) hosted the event that included four tables of arts and crafts for children, Chinese dance performances and dance lessons by the Fei Tian Academy of the Arts, hula hoop lessons and demonstrations by the Bay Area Hoopers, free drawing lessons, and up-close magic a roving magician. Park Station brought a motorcycle and SUV that the kids climbed on and got to turn on turn on the flashing red and blue lights. 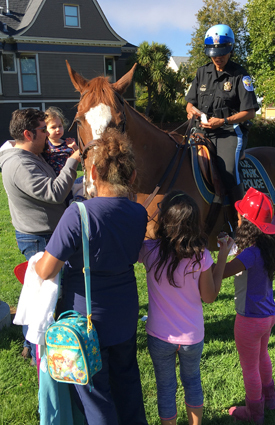 The U.S. Park Police brought their police horse, Park Rangers displayed their ATV, and SFPD brought a police dog. SAFE and other local safety organizations hosted tables to provide tips and information on health and safety. Everything was free, including a free raffle with a grand prize of a Kuna security system, including the camera and one one-year of service. 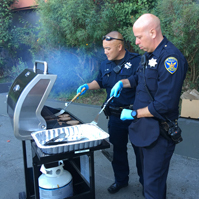 Officers from Park Station ran the grill and served hamburgers and hot dogs with all of the fixings and CPAB members brought a whole table of desserts. It was a great chance for everyone to meet and interact with Capt. Sanford and the other officers from Park Station who patrol the Duboce Triangle and Duboce Park. They received lots of compliments for being very responsive to our concerns and implementing a dedicated foot patrol that goes through the park on a regular basis. 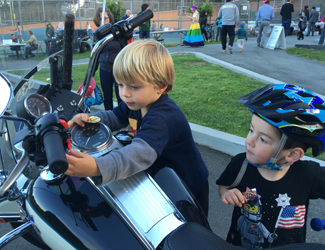 This was the first time in 20 years that National Night Out was held in the Park District was held in Duboce Park after many years at the Boys and Girls Club on Page Street. Capt. 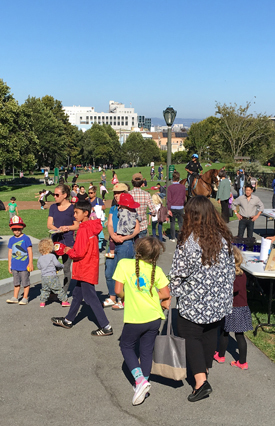 Sanford said, “This was the most successful National Night Out that Park Station has ever held.” There is a very good chance that the event will be held again in Duboce Park next year. National Night Out is the country’s united effort to promote neighborhood involvement to help stem crime and create safer neighborhoods. This is accomplished through strengthening police-community relations and encouraging neighborhood camaraderie by hosting neighborhood events. 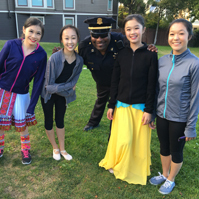 Nine of the ten San Francisco district police stations participated in the free event. Hundreds of dogs and their human families helped celebrate DogFest on Saturday April 18. 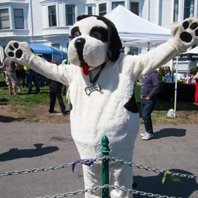 The annual event is a celebration of dogs and kids benefitting SFUSD McKinley Elementary School, a K-5 public school at Castro and 14th Streets. 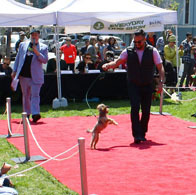 There were are lots of great competitions for dogs and their human owners and celebrity judges picked winners in eight categories: Best Costume, Best Trick, Best Bark, Best Owner/Dog Look-Alike, Best Body Part, Best Lap Dog, and Best Trot. 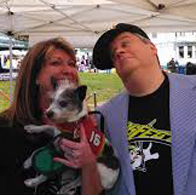 The very entertaining and McKinley School parent Daniel Handler of Lemony Snicket fame was once again the Master of Ceremonies for the Dog Show. 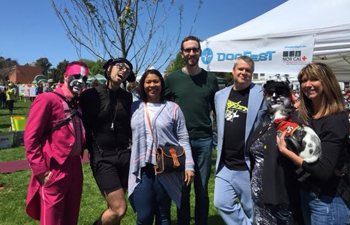 Supervisors Scott Wiener and London Breed and Chronicle columnist Leah Garchik were among the judges. A special performance by Cherry Hoops, “a one-woman hooping empire,” was this year’s half-time entertainment. There was also a raffle, a silent auction, a Chow Zone, a Rescue Zone, and a Kid Kennel featuring carnival games, bouncy houses, an archery range, face painting, children’s activities, baked goods, cotton candy, popcorn, and other goodies. 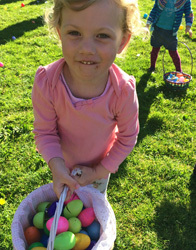 The annual Easter Egg Hunt in Duboce Park last Saturday morning was another success and was featured on the front page of the Bay Area Section of Sunday’s Chronicle http://www.sfgate.com/bayarea/article/Easter-eggs-a-hit-at-Duboce-Park-hunt-6179284.php . 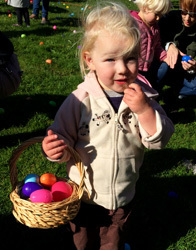 About 100 kids picked up 1500 plastic eggs filled with treats. 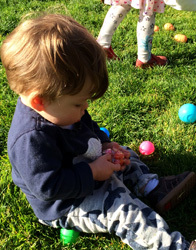 They used their own baskets to collect them and were allowed to exchange sugary treats for healthy snacks from Pastor Gordon Wohlers of First Christian Church, sponsor of the event and our neighbor across the street at Duboce and Noe. 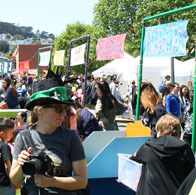 Pictures of the event can be seen on the Duboce Park’s Facebook Page https://www.facebook.com/duboceparksf?ref=aymt_homepage_panel . 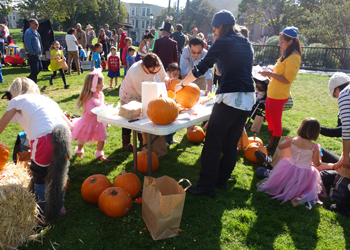 Neighbors, especially the kids, enjoyed the “It’s the Great Pumpkin Fest, Duboce Triangle” in Duboce Park on beautiful, sunny a Saturday morning on October 26 from 10 a.m.-noon. 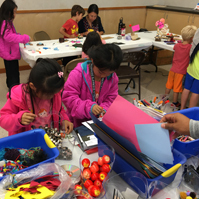 The free event included pumpkin carving, a ring toss, miniature golf, a fishing pond, a photo booth, face painting, balloon making, a jumpy house, and, of course, treats. The event was sponsored by First Christian Church and New Community Church.